Kyocera DuraForce Pro is the latest smartphone released by the Japanese company, which is known in the mobile industry for its innovative features such as solar charging smartphones ideas. This DuraForce Pro is a very particular smartphone, as well as being resistant to usual in general, is constructed to be resistant to new conditions that would otherwise be lethal to other normal smartphones, and also integrates an action cam capable of recording FullHD videos with a vision of 135 degrees. 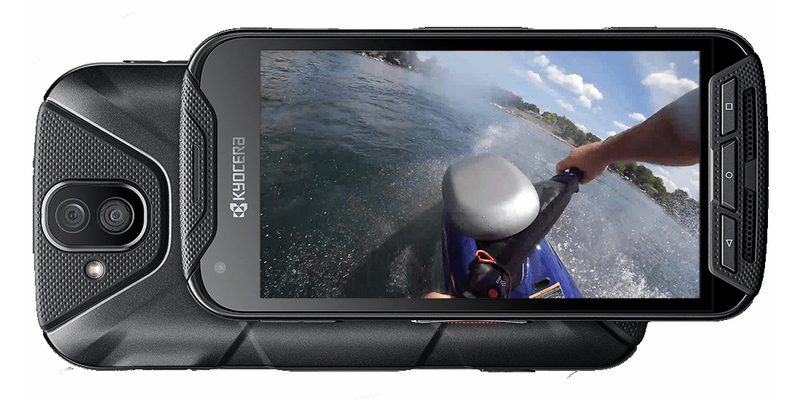 Kyocera DuraForce Pro is able to withstand shocks of all kinds, resists falls (810G military standard), has a IP6X certificate, which is made dustproof, and is submersible in water up to 2 meters deep for a maximum of 30 minutes (IP68). Moreover, it supports scratches, vibration, extreme temperatures, solar radiation, and more. Moreover, the DuraForce Pro has two rear cameras, a "normal" 13 megapixel camera, and the other mentioned above, called action cam with a wide super viewing angle of 135 degrees, which produces a beautiful spherical effect for the images; a bit like in the case of LG G5, capable of recording at the highest resolution of 1920 x 1080 pixels, and is compatible with GoPro. Its technical specifications are not low-end, precisely, although we talk about a Qualcomm Snapdragon 617 processor, 2 GB of RAM, 32 GB of expandable internal memory, 5-inch screen with 1080p resolution, also shockproof, and battery of 3240 mAh (that can recharge to 50% in 30 minutes thanks to the Quick Charge 2.0 technology); it also has microUSB 2.0 and Android 6.0 Marshmallow on board. As can be sensed by all specifications shown, its price will not be cheap, because it is also a hybrid smartphone. The release of the Kyocera DuraForce Pro is scheduled unfortunately only for the US, where it will cost $ 418 and will be sold by AT&T operator.